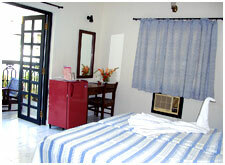 Access : Location : On the Calangute Beach and with direct access to it. 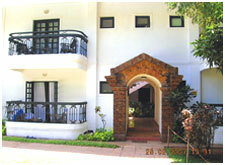 The Rooms are situated amidst lush gardens. Distance : 44 kms. from Airport, 7 kms from Mapusa, 14 kms from Panjim, 44 kms from Vasco. Swimming pool, Room Service, Sun Loungers and Parasols, One day Laundry, Postal Service, Safe Deposit Lockers, Power Generator, Internet facilities, Mini shop, Foreign Exchange, STD / ISD, Doctor-on-call, Games room, Conference room, Ayurveda health clinic, Taxi Service.